A housebuilding sales director from Wolverhampton says barriers for females are continuing to tumble in the industry – but says more still needs to be done and is calling on more young women to join the sector. 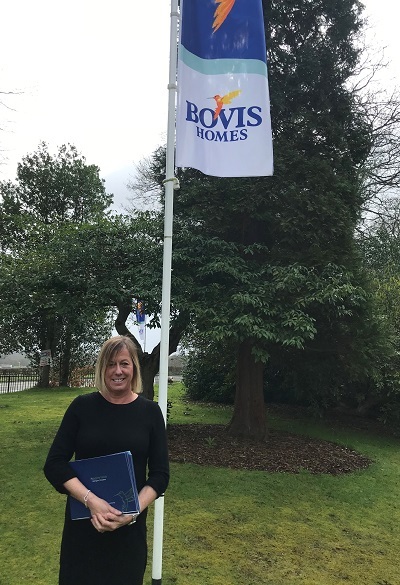 Elaine Cartwright, regional sales and marketing director at Bovis Homes, said young female recruits from outside the sector were encouraged to apply for roles at the company to add fresh ideas. Elaine, from Codsall, joined the company's Mercia region earlier this year and said: "The housebuilding industry has changed hugely in recent years. Instead of just being a male-dominated industry, there is a lot more diversity. "There are no barriers at Bovis Homes and I'm able to bring a lot of experience and knowledge with me. Having a new-build home myself, I have seen how a customer goes through the journey with a housebuilder. "To be able to bring new ideas to the business and train and develop young people, is wonderful. There are a lot of young team members from outside the industry, which is great for the business as they have different experiences and they are very passionate to learn about all aspects of housebuilding. "We would like more young people and women from all types of backgrounds to join Bovis Homes and input into our success." Elaine, who runs the sales and marketing departments and covers Cheshire, Nottinghamshire, Staffordshire and Shropshire, added that offering a personal touch for customers was key and new starters at Bovis Homes needed empathy and to be approachable, hardworking and ambitious. Elaine has 30 years' worth of experience in the housebuilding industry and started as a part-time sales advisor before taking on full-time roles and working in the part-exchange department and customer care team. She has also worked as a senior sales manager covering the Midlands, East Midlands and North West, before working as a director for 13 years. Joanne Morrison, regional managing director at Bovis Homes, said: "Elaine is an inspirational new senior member of the team who offers clear direction, bags of experience and opportunities for all, including young people. "She has worked from the ground level up and Bovis Homes is very lucky to have her expertise."